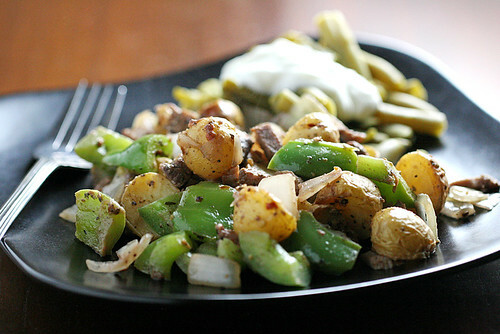 Leftover meat & potatoes revisited. With green beans with sour cream and vinegar on the side. 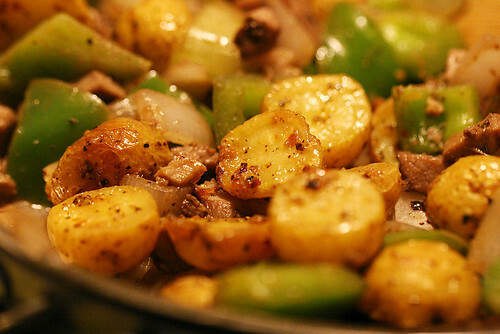 This time I sautéed some onions and green peppers, tossed in the pork (chopped into fine little bits), seasoned with a little marjoram, nutmeg, Worchestershire sauce and dijon mustard, deglazed with some red wine, and threw in the potatoes. I'm really enjoying the nutmeg/Worchestershire/dijon seasoning combination that I picked up from Emily's meatless shepherd's pie and mushrooms on toast recipes. It seems to work with all things mushroomy and potatoey. I don't really know what marjoram is or what it's supposed to be used with, but it seemed to work here too. It DOES totally work with everything mushroomy and/or potatoey ... but I suspect I am in a seasoning rut, or at least prone to repetition. But it does sound good! I know nothing about seasoning, except to use basil with Italian things.